Basunti at 500m above sea level has a unique micro-climate. The cooling presence of the lake, when water levels are high, means that the climate is tempered and breezes help keep the air fresh for much of the year. Like much of the sub-continent, Basunti enjoys two seasons akin to perpetual high summer. 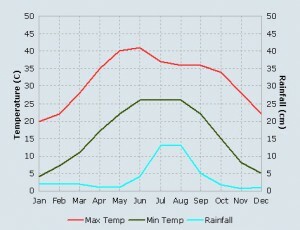 From mid-March to mid-June, Basunti experiences warm, mainly dry and sunny days. Flowers and shrubs start to bloom in mid-February and first flocks of migratory birds arrive for spring as temperatures rise. By mid-May the days become progressively hotter and the lake’s foreshores have receded to reveal the sunken temples upstream at Bathu – and improve the fishermen’s chances of catching. Basunti closes in mid-May as the mercury rises. The monsoon rains arrive, usually by late June. Over the next two months the lake’s water level can rise as much as 30 meters. The entire landscape becomes green and fresh and the grass seems to grow several feet in a matter of weeks. The monsoon usually lasts until late August. When Basunti reopens for guests in late September the days are warm and fine and the garden blooms all over again. This Indian summer lasts through October and November and into early December. Temperatures shown are based on reported local averages for the region.